Warning: If you have graffiti do not try to remove it. Please read below first. Graffiti is a community problem that drives down business revenue, lowers property values and promotes a view that you are in an unsafe community. Where graffiti pops up it is not unusual for more graffiti instances to follow. Quick removal of graffiti is important, not only because it’s unsightly, but the longer it’s allowed to remain the more difficult it is to remove. Do not try to remove the graffiti! When you apply chemicals to the substance the graffiti was made with, you change it’s chemical composition. Graffiti removal chemicals work on specific substances and may not work on this newly created hybrid. Also, when you try to remove the graffiti you will end up pushing it deeper into the pores of the surface. It is better to let the graffiti sit on the surface, if it gets pushed in it will leave a halo effect that may remain even after I’ve cleaned it. If you must try, do it on a tiny area, not the whole thing. Don’t paint over the graffiti. It just makes the graffiti a whole lot harder to remove. Instead, cover the graffiti up with cardboard or plywood. Each instance of graffiti removal is different, as different substances are used. In some instances of fresh graffiti it can be removed quite easily, in others, especially those where removal was already tried, it can be more difficult. 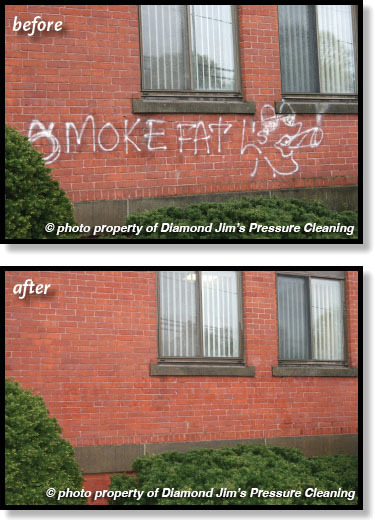 Graffiti removal chemicals are very specific and it takes a trained professional to use them. It also takes time for the chemicals to work. Please have an outside spigot on when I get there. Access to your buildings water is critical when removing graffiti. If you are in need of graffiti removal services in Connecticut, call us today at 203-558-0968.